I have been presenting stories and content from my travels in this space for over 3 years now, I published my first post in May, 2014. From there to here, I have come a long way in understanding the content I like to present and it has been received well. I take pride in the fact that all of my audience is organic, and it loves and appreciates my work. 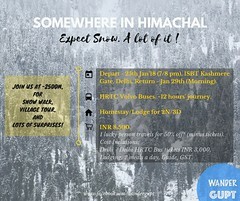 You can now Travel With Me and experience the crazy awesomeness which comes with the unplanned journeys which I have been enjoying for years now. Head here for the link of my Travel Calendar – Link. Also, you can now hire me to custom design a trip for you and your friends, and lead it for you as your personal travel guide. To hire me, you can write to me via mail at wanderingjatin@gmail.com or use the form below. How about an evening where I take you places through my words? Invite me over for a Travel Talk where I make you laugh and smile over the interesting stories and experiences from my journeys. Allow me to recreate scenes for you to feel and breathe the winds, the rivers and waterfalls, the landscapes, the heritage and history of destinations faraway. I give Talks on multiple topics ranging from spreading the word about importance of Outdoors, life of Outdoors, Experiential Travel, Life in the Himalayas, Eco-Tourism, etc. I also share tales from my heartwarming experiences over my travels and talk about my journey from a Corporate Professional to the field of Travel. I believe these Talks benefit folks by helping to scale their distances from the faraway lands, promote in them the concepts of responsible travel and experiential travel which still evade us, encourage and motivate by providing things to look forward to and of course, it is undebatable how the Outdoors make us a responsible person and a better team member. To book a Talk session, you can write to me via mail at wanderingjatin@gmail.com or use the form below. If you are looking for Travel related Content for your website/magazine/business, I can provide that to you. I offer travel content writing solutions on freelance basis. You can write your requirements via mail at wanderingjatin@gmail.com or use the form below. I am planning to launch the gear reviews section to help my readers make wise decisions while purchasing their travel gear. Please note that I will be doing only unbiased reviews. If you have a product you’d like me to review, please get in touch with me via mail at wanderingjatin@gmail.com or use the form below. I am putting this here as an experiment. My readers know it well that I am game for only unbiased, unfiltered and experiential soulful journeys, and that’s the reason I have evaded sponsored travel for long. So, if you’re a Tourism Board and offer such soulful experiences, I would be more than happy to work with you. If you’re a sponsor and allow me to travel my way, I would be more than happy to associate with you (umm given I like the product you’d want me to promote). You can also sponsor the weekly (travel) quiz prizes I conduct on my social media handles, you can search it on Instagram and Facebook under the hashtag #wanderingjatinquiz. If this sounds interesting, you can write to me via mail at wanderingjatin@gmail.com, or use the form below. If you’re a traveller, and seeking travel consultation, I can help you with that. With an experience of traveling to 19 Indian states, Bhutan and Nepal (Mt Everest Base Camp) at the moment, I take consultation queries on these. You can head to the Travel Consultation page for more details on this. Link – Travel Consulation. I have recently launched the Souvenir Shop where you can buy souvenirs and collectibles handpicked from different places. Currently, I have a few items from Kerala, and the ones from the Himalayan Land Nepal will be up for grabs soon. Link – The Souvenir Shop. Please understand that I am living the life of a Digital Nomad traveling most of the time, and good internet speeds can be a luxury at times; I will revert to your queries as soon as I can.